I am finally getting around to sharing about our vacation! I mentioned a few weeks ago that we were going to spend a week camping in South Dakota. Overall, we had a really nice time! The kids loved sleeping in a tent and running around outside, getting dirty. I love waking up to the sun shining through our tent. Though, for half of our vacation it was not sunny when we woke up, so that I did not love. But we decided to escape the rain the last day and spend some time in Wyoming, which made me love it again! Overall, there were a few things I think we did right, and a few things I would do better. 1. We didn't have to make reservations for the whole week. The campground we stayed at was alright (and there were friendly bunnies running around that the kids loved to chase). But the owner's attitude toward the patrons could have been better, and there were some other campgrounds that I think we would have liked more for other reasons too (better playground, for example). 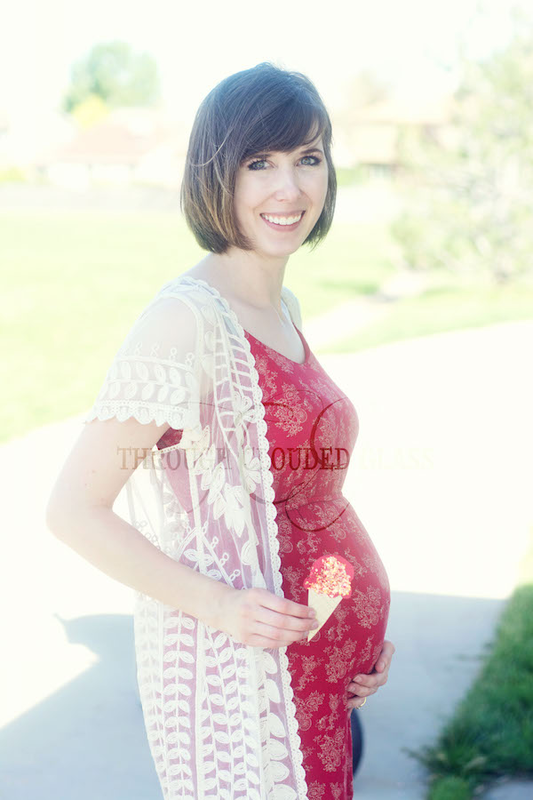 I am 26 weeks pregnant now! The last couple weeks Baby Girl has been developing hearing (she should be able to hear Derek talking now, as well as me), and she is probably starting to practice breathing movements! Last week we celebrated my birthday! Derek and I had a nice birthday date (saw Jurassic World - tied in nicely with the original movies, I liked it), and then we enjoyed a quiet evening at home eating cheesecake and watching another movie (McFarland, USA - I liked it). It was a nice way to recover from vacation last week! We are finally back from vacation, and I was able to sort through all my pictures! 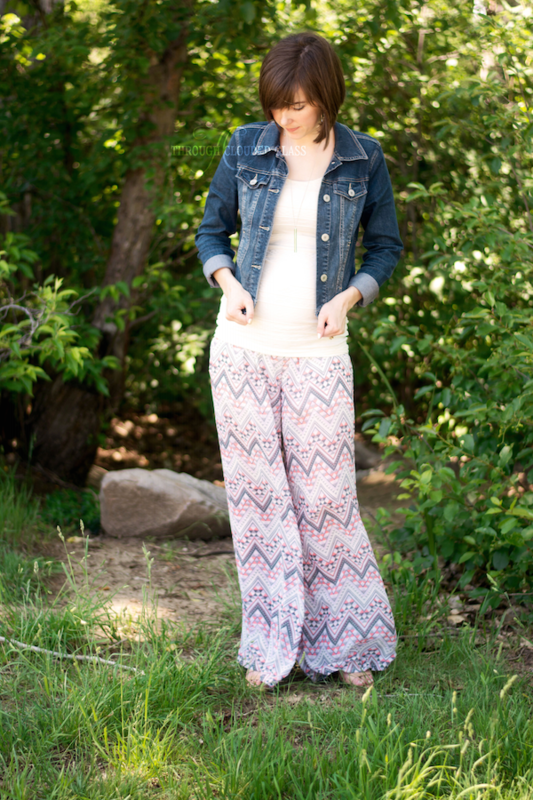 We took the 24 week belly pictures the day we left for vacation, so this update is really late - I'm really 25.5 weeks now. Of course the big news is that we finally revealed the gender to everyone . . . and it's a GIRL! 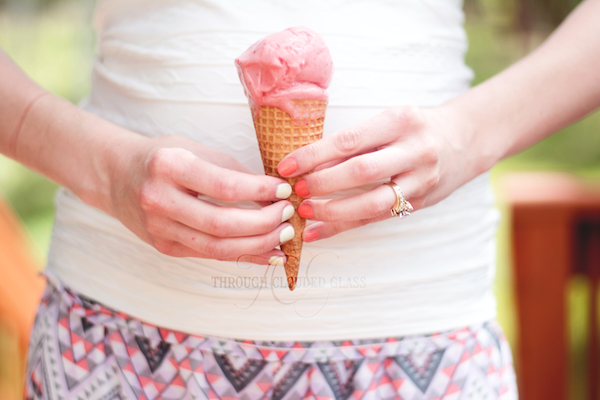 We are so excited to be expecting another little lady! I think it will be good for Gwen to have a little sister to play with. Honestly, I was a bit surprised! I try not to get my head set on one gender too much either way, but for a couple weeks there I was pretty sure it was going to be a boy. I tell you, my pregnancy symptoms have been so weird this time around. This is my fourth baby, so I figured I could make a pretty educated gender guess, but I have had boy and girl symptoms throughout most of the pregnancy! 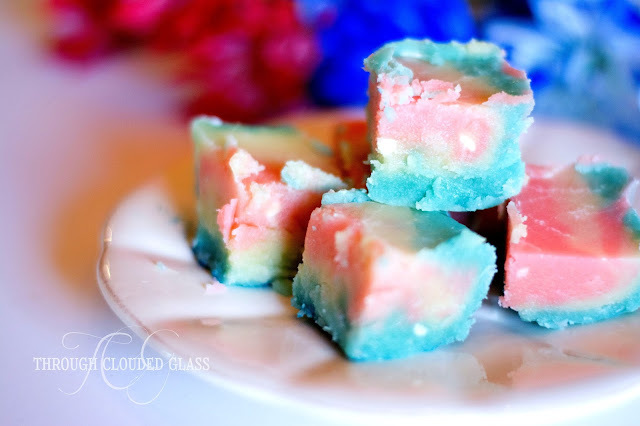 When my dad was joking at our ice cream social gender reveal party that it was twins, I told him he shouldn't mess with my head, because my symptoms were making me wonder for a while there! I am so happy it's a girl though, and Derek and I have a good idea of what her name will be. It may change, because I am not 100% sure, and I like to keep my options open, but it's pretty likely. 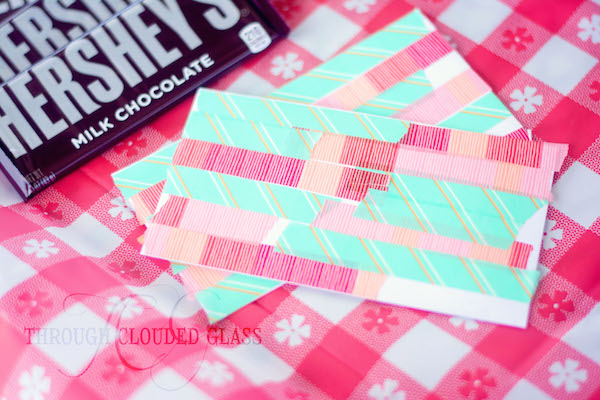 Now that I know it's a girl, I am anxious to go shopping and get started on her baby quilt! I have an idea in my head for the color scheme, but it all depends on whether I can find the right fabric for what I have in mind. 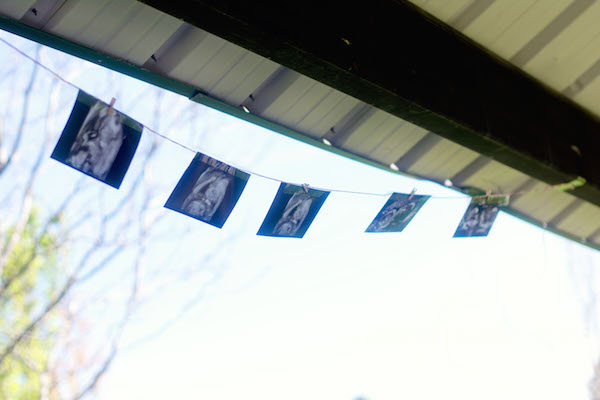 I did see some cute decorations for the "baby corner" at Hobby Lobby though, so I will probably pick those up soon. You can check out my baby Pinterest board for some of the quilt patterns I'm looking at! Baby Girl is now officially "viable" (even though babies can survive as early as 22 weeks! ), so that is kind of exciting! Lungs and taste buds are developing more this week. I can tell the lungs are developing, because I have already felt some hiccups from our little girl here and there! This little girl is not a big mover, but I can tell she is getting bigger, because when she does move it is more pronounced. I can tell by the movements that she is still sitting really low down (which I think is weird, since I am carrying higher). For a while I think her days and nights were mixed up, but now I am feeling more movement during the day - now if she can just keep her schedule straightened out until she comes! I have been feeling great, with just some back pain when I am on my feet too long. 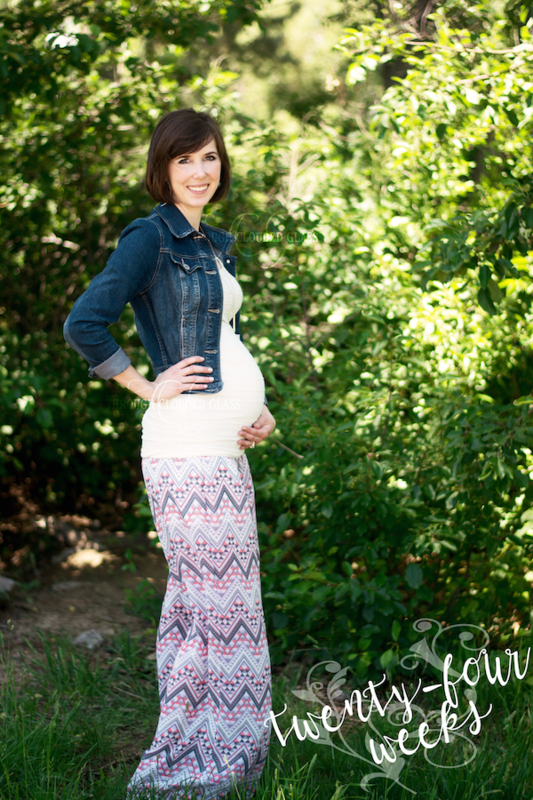 Most of the other unpleasant symptoms have subsided, so I think I have entered the easy part of pregnancy! 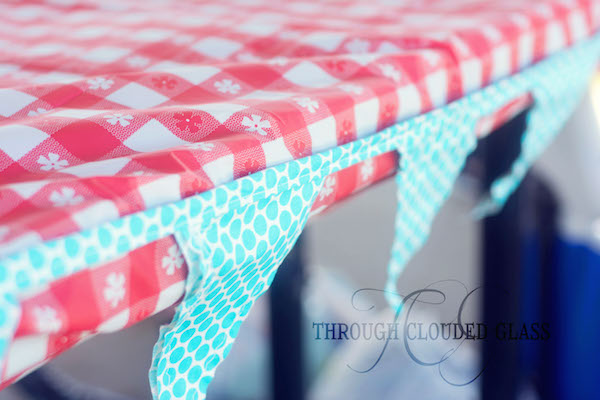 I should get moving on all my baby projects while I still have the energy! You know how sometimes you start a book, and it's not fantastic, but you just keep reading because you feel obligated to finish it? That happens to me sometimes. I used to feel that I had to finish every book I started, but in more recent years, I sometimes just don't. Reading, especially reading fiction, should be enjoyable, right? So for vacation last week I planned to bring a few books that I knew would be books that I really wanted to read and knew I would enjoy, and Married 'Til Monday by Denise Hunter was one of them. 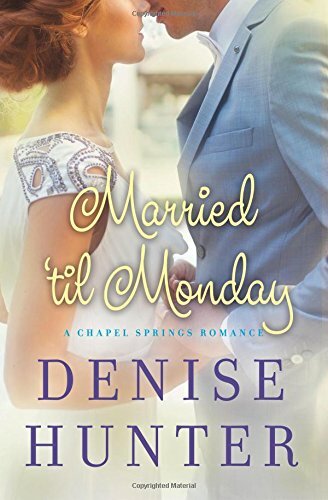 Married 'Til Monday finishes off the stories about the McKinley family that make up the Chapel Springs series. I have read two of the other books in this series, and I really enjoyed them. I had been hoping Hunter would write one about Ryan, who is still in love with his ex-wife, Abby, so I was particularly looking forward to this book. One day Ryan gets a call from his ex mother-in-law inviting him an anniversary party, and he realizes that Abby never told her parents that they got divorced. He covers for her, and takes the opportunity to contact her again. He volunteers to pretend to be married to her for the weekend, with the secret intention of winning her back. As with her other books, I felt like Hunter got a bit descriptive of some of the feelings associated with the physical affection between the characters in this book, though there was nothing inappropriate. That is really the only complaint I ever have with her romance novels. I thought Hunter did a nice job of weaving Ryan and Abby's history in with the rest of the story in a natural way. One of the reasons I like reading Hunter's books is that she is so good at taking a plot that could get slow and keeping it interesting throughout. Every time I ended a chapter I immediately wanted to start the next one so I could see what was going to happen. I'm kind of bummed that the series is over now, but I am looking forward to seeing what Hunter comes out with in the future! Note: I received a digital copy of this book for free from NetGalley in exchange for this review. This is my honest opinion. 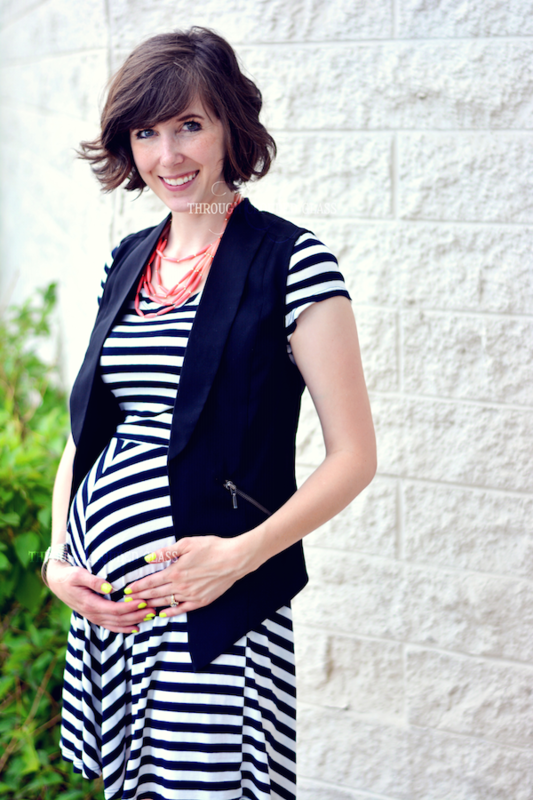 Hello, my name is Keri and I share over at Living In This Season. 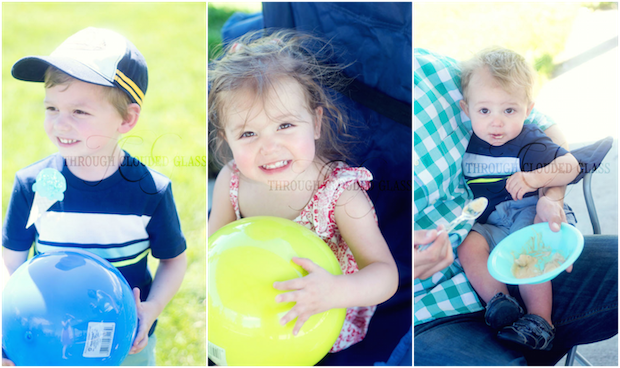 I am a mama to three little ones (ages 6, 3, and 1) and wife to my husband of almost 10 years. I love connecting with others and sharing about living life fully in our current seasons of life. Stop on by and say hello! Summertime is one of my favorite times of the year. We live in South Carolina near the coast so are grateful to have what seems like an extended summer. The beach is one of our favorite places to go as a family and I have found a few products to be absolutely necessary for our beach trips. Sunscreen- I have loved using Babyganics Mineral-Based Sunscreen. It is perfect to use for the whole family and provides plenty of protection. Headband- Recently, I was given this headband from Mag Soul Shop to try out and I am loving it. It easily holds back my hair and all those fly aways I have. They have so many cute headbands- see more HERE. Flip Flops- Honestly, I probably wear flip flops the majority of the time. My sister convinced me to try Reef flip flops and I am loving them so far. They are so comfortable and cute. 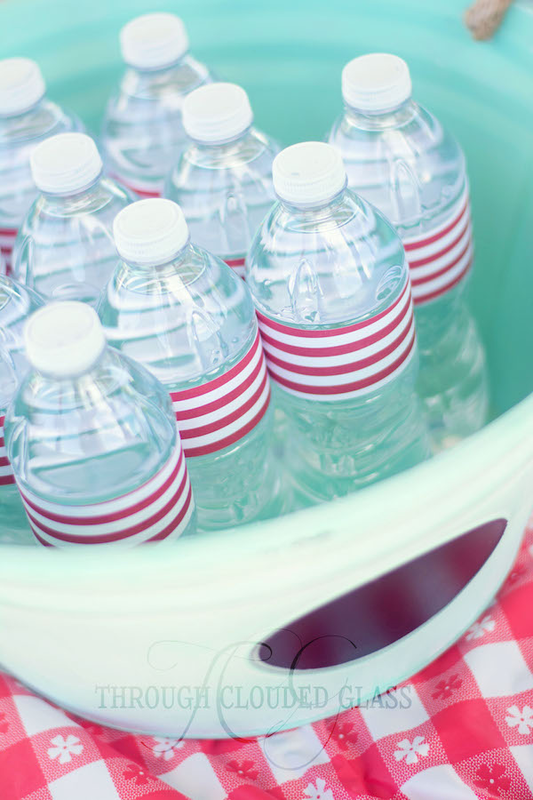 Water & Snacks- What is it about the beach that makes me so hungry?! We always have some snacks to take to the beach along with plenty of water. I am currently looking for a good water bottle- any favorites? 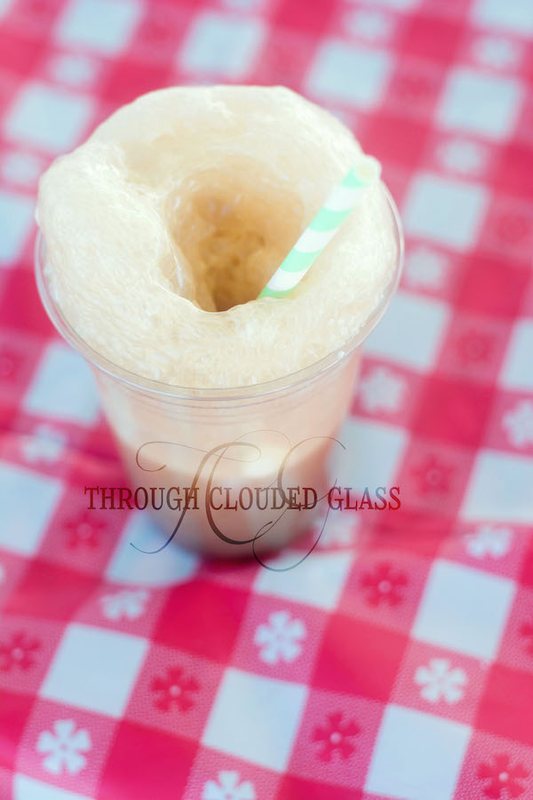 Sand Toys & Fun- My kids love having some sand toys to bring along. I have learned to just bring a few items because most of the time they end up playing with the drift wood and shells. It is also so important to go to the beach ready to have some fun as a family. Some beach trips end up being filled with some tantrums or tears, but I try to enter the time ready for whatever. It is always a choice in how I react to the circumstances- joy or anger? 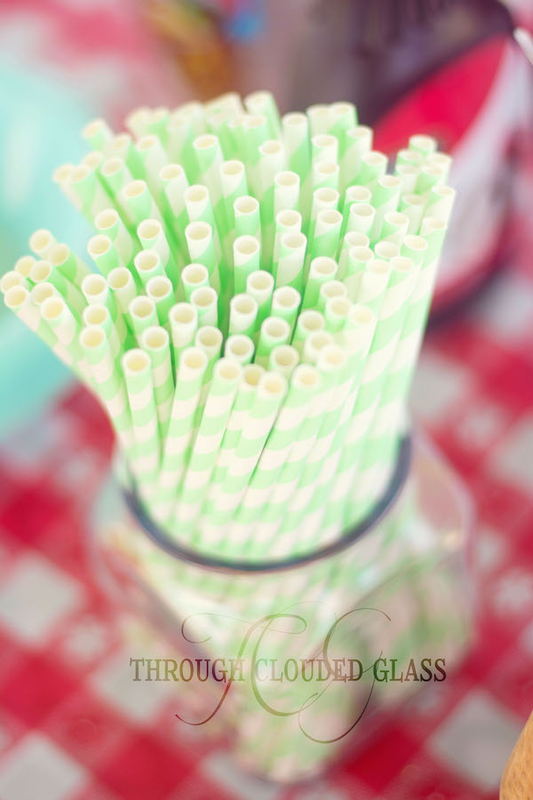 What are some of your favorite beach necessities? Note From Keri: This post contains Amazon Affiliate links, to read my disclosure policy go HERE. 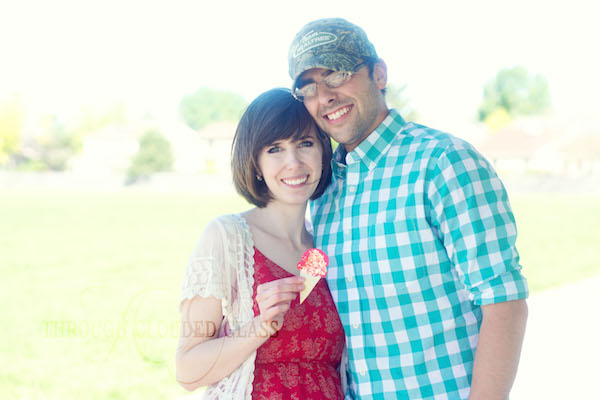 Since I am off enjoying sun, dirt and campfires with the family this week, I asked one of my dear blog friends, Natalie, to share a guest post with you guys! 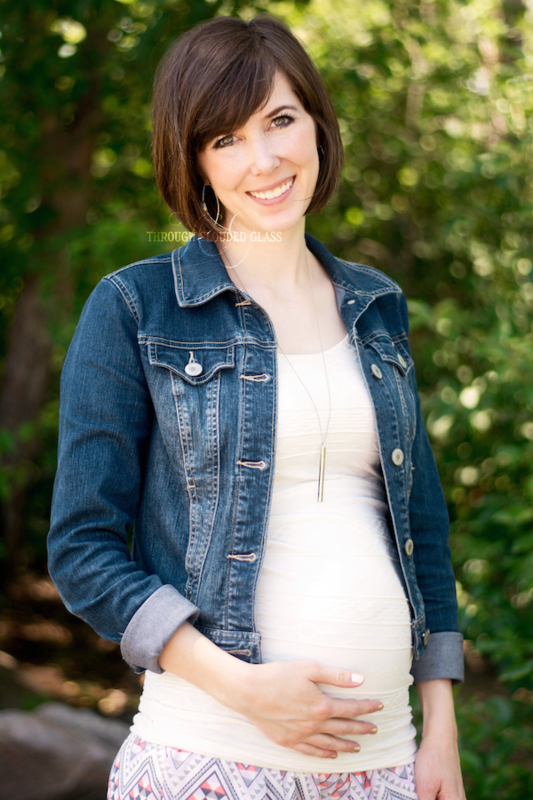 Natalie is a blogger at She Builds Her Home, and she is a mama to two adorable little girls - and her family is in the process of adopting another sweet baby! 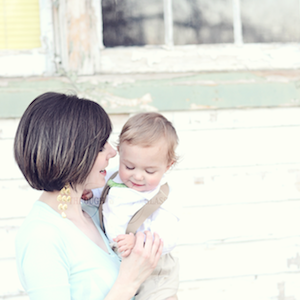 I love reading her tips on adopting, homemaking, marriage, and motherhood. 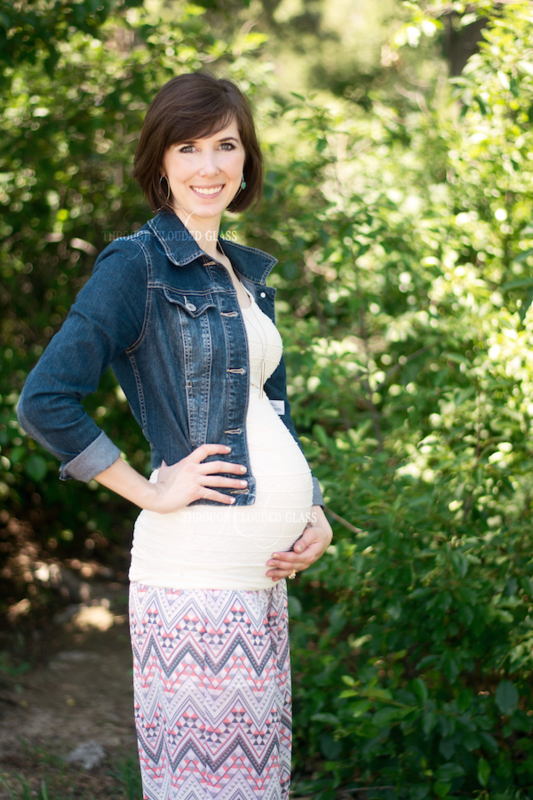 Natalie is going to share some tips for ways to bless new moms, and I found myself nodding my head to all her tips - especially the last one! Moms, please add your own experiences or tips at the end. 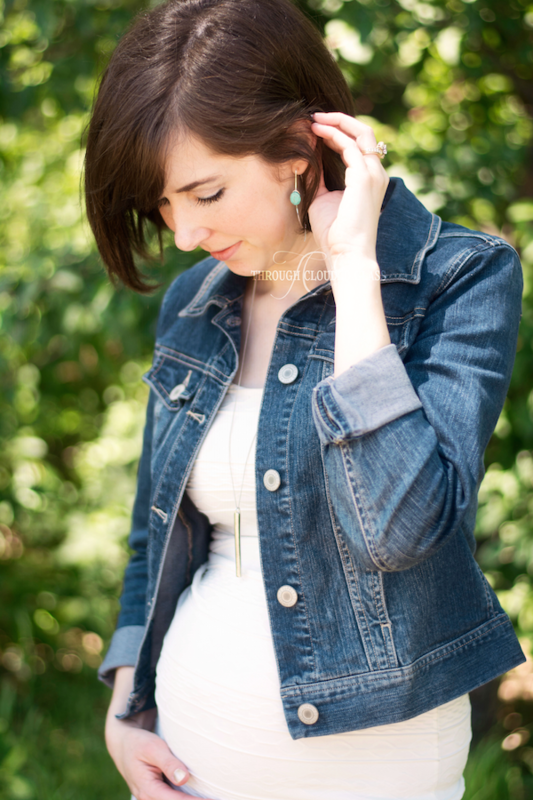 We'd both love to read what you found helpful after having your baby(ies)! I've been that mom twice. The one who just had a baby, is tired, is sore, is hungry, is emotional. If you haven't been in those shoes (or sometimes even if you have!) it is hard to know what will bless her the most. What will help her, what will make her feel most loved, what will make her life a little bit easier. So I've compiled a list of some of the things I think would most bless a brand new mom with a little one(s). 1. Text, don't call her. New moms never know what's going to be happening when. If they're trying to figure out breastfeeding, or simply cuddling their baby, they won't have an extra hand to talk on the phone. They might be sleeping at 2 p.m. - you don't want to be the guy that wakes them up! A text will give them the freedom to respond when it is convenient for them and not feel pressured to answer the phone or call you right back. 2. Bring their family a meal. Try to make this as easy on them as possible by bringing disposable containers so they don't have to wash and return them to you. If they are getting multiple meals it may be hard for them to remember which ones belong to which people. 3. Offer to stop by and bring her something. Anything. Maybe she needs more diapers, maybe she wants Starbucks, or maybe she needs stool softeners - ha! I didn't say it will be glamorous, but just ask her what she needs. 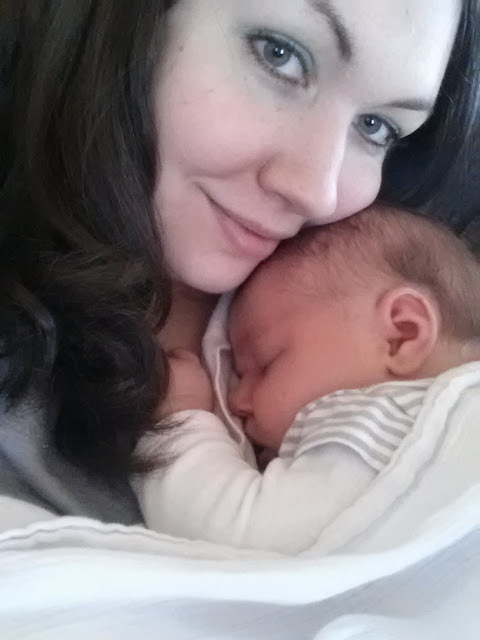 Getting out of the house to run to the store with a 4 day old is hard. She'll appreciate the offer. 4. Lend an ear. Ask her if she wants to talk. Maybe she will, maybe she won't. If she does, be prepared that she might make no sense at all. She might tell you that she actually misses her baby so much it physically hurts (you know, the baby she is holding at the moment she says that). She might cry about how she feels so skinny and fat at the exact same time. Maybe she'll even confess that as tired as she is, she can't sleep because she can't stop staring at that beautiful creation and wondering how it belongs to her. Whatever it is she tells you - be supportive. Laugh with her, cry with her, hug her (if she wants a hug), just be there for her. 6. Send her a card, a care package or just an email/text with no agenda. Just to say 'hey, I'm thinking about you and you're rocking this mom thing!' Don't expect a response, a thank you card, or anything else - just do it to let her know she is doing a great job! 7. 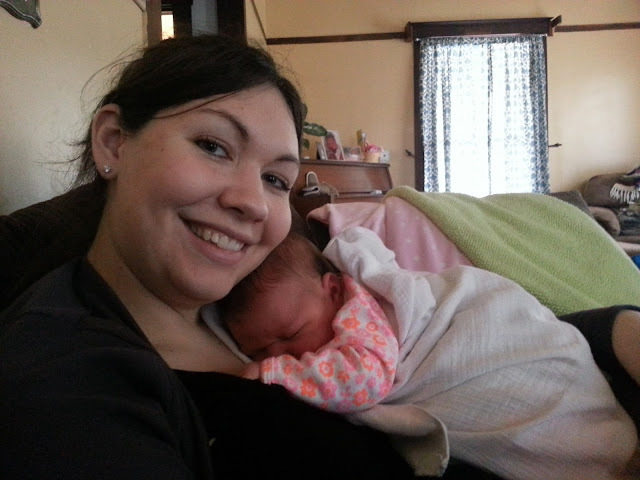 Offer (with no pressure) to come and hold/rock the baby while she takes a nap or shower. Sometimes new moms feel like they just physically cannot put the baby down because the time is so fleeting. Don't be offended if she says NO WAY! 8. If she has other kids, ask her how you can help out with them. Could you take them to the park? Maybe to the library? Maybe you could even just come over and cook lunch for them while she focuses on the baby for an hour or two. 9. Give her some space and don't take things personally. A lot of new moms have tons of scary emotions going on. I bawled 10 times a day because I loved my babies so much, and that scared me because no one told me it would happen. I wanted it to just be me and my family in a bubble for awhile and some people were offended by that. Don't be. Try to understand that this is precious time for them! 10. When you come to visit the new baby or bring a meal (not when you come to help out), don't linger. She will probably be un-showered, her house will be messy and she'll have a baby attached to her chest. She probably won't feel like entertaining guests. Drop off the meal, tell her how beautiful her baby is and don't stay longer than 30 minutes tops. Mamas-what else would you add? 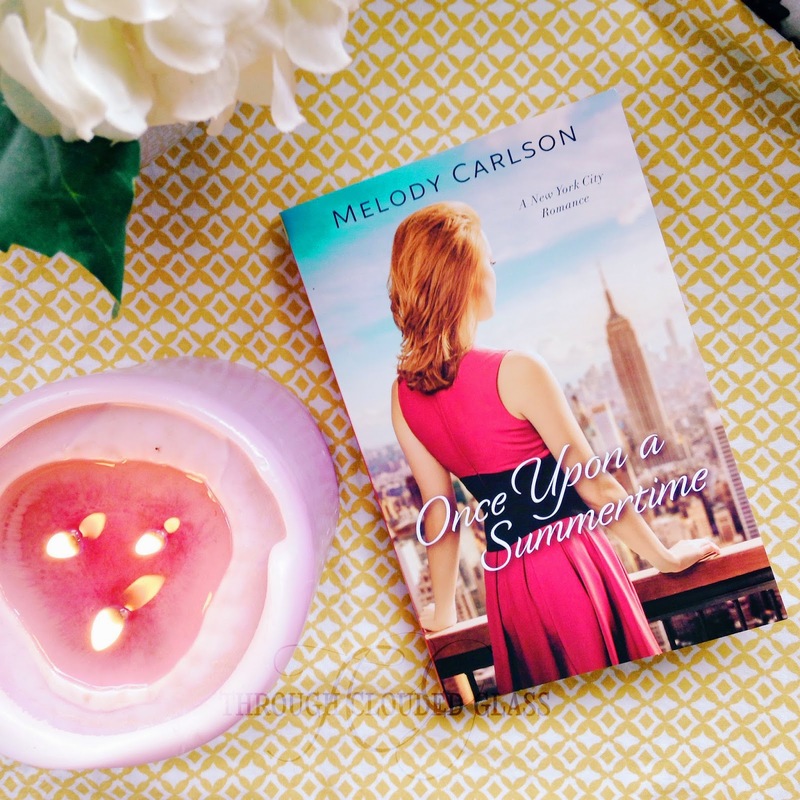 Once Upon A Summertime by Melody Carlson follows the story of Anna, a manager at an inexpensive motel who dreams of working in a bigger hotel. After some tension with her current employers and a run-in with an old friend, Anna ends up with a chance to work at a boutique hotel - in New York! She leaves everything she already knows and heads to the Big Apple, and is surprised when she finds herself working at the same hotel as an old high school classmate. As sparks fly, Anna and Sean struggle with the hotel’s “no employee relationships” policy. How will they work it out? I started this book, and I did not want to put it down! Anna’s character was likable, and the development of the romance was sweet. What I really appreciated about this book was how the author wove in the character’s family relationships dynamics, friendship dynamics, and work dynamics into an interesting story. The interactions and stresses that Anna had to go through weren’t over the top or outrageous - all her struggles were very believable. I really enjoyed this book! The only thing I didn’t like about it was that I felt the the storyline was wrapped up too quickly in the end - it literally goes from having nothing resolved to everything figured it out within one chapter. I felt like the book could have had ten more chapters to really focus on resolving and developing more of the problems and relationships, and even with that many more chapters the book wouldn’t have felt too long. As it is, the end felt very haphazard and hurried to me. I liked the way it ended, but I think it would have gotten a solid five stars from me if it wasn’t so rushed. Regardless, I loved the storyline and imagery in this book, and it made me want to visit New York! I think Once Upon A Summertime would be a great pool or vacation read - fun, and just the right amount of drama. Definitely check it out! Well, I am off this week on vacation - Derek and the kids and I are going to be camping in South Dakota! 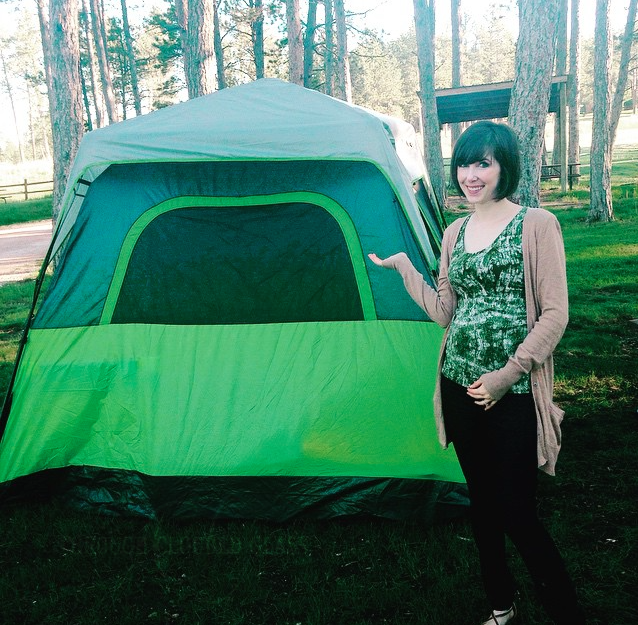 I never really thought of myself as a tent-camping type of girl, but a couple years ago we went camping in Arizona, and I loved it. I am excited to go again this year, and I'm thinking South Dakota will be such a fun place for the kids. I think even Gwen, at two years old, will think presidential faces in the side of a mountain are pretty cool. I spent most of last week packing - on the one hand, camping/road tripping is great, because you can bring snacks or whatever else you want without space (except for the size of your car) or airline rules being an issue. On the other hand, camping with little kids takes a lot of prep work, and our van is packed pretty tight. Plus we are still potty training . . . so yes, it will be interesting trying to get the kids out when we make stops! I packed a few movies for the kids to watch on the road, as per usual, but this year I decided to bring some fun new books to read to them too! I've been having a lot of fun reading Winnie The Pooh to Wyatt over the last month or so. He is finally to the point where he is getting better at listening to a story without a lot of pictures, so I am going to bring some chapter books to read to the two big ones - I think they'll enjoy it. 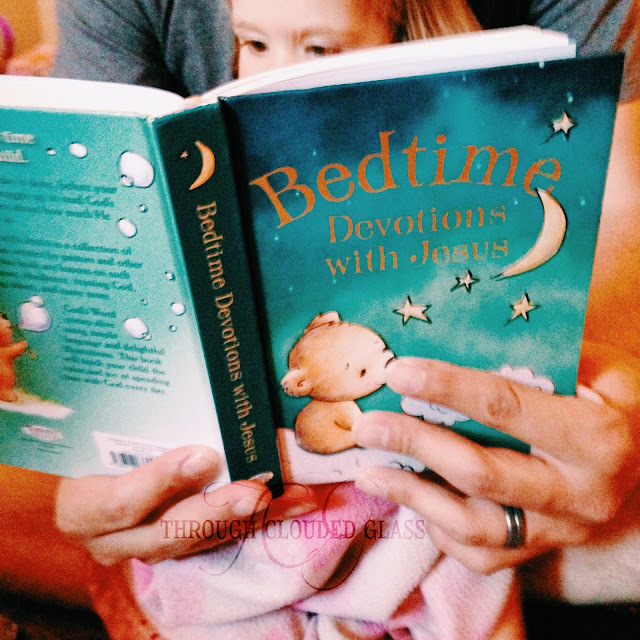 I am also excited to bring along our brand-new devotional from Tommy Nelson to read to them as they go to sleep! We always read a Bible story and/or a devotional with the kids before bed time, and I think it will add another element of fun to change things up on vacation with a new book. 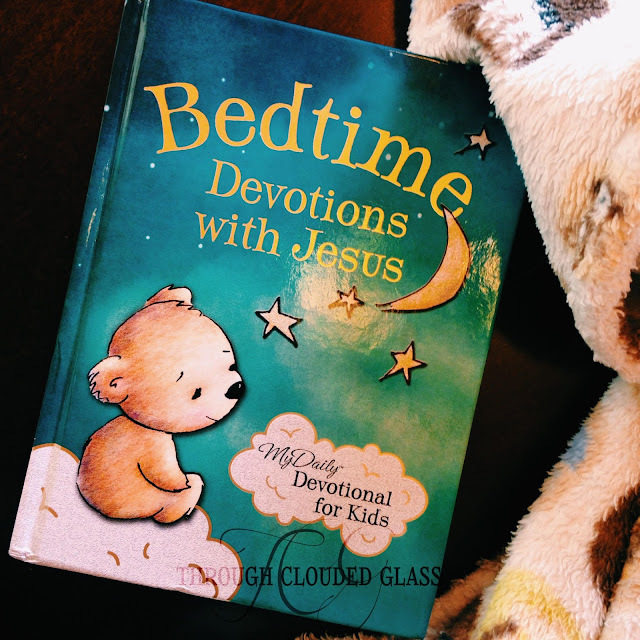 Bedtime Devotions With Jesus starts each devotion with a Bible verse and ends with a short prayer of thanks to God of everything He does for us. There aren't a ton of pictures, but that is okay with me, because my kids tend to get distracted by really detailed pictures, so the simple illustrations on every other page are a good amount, I think. 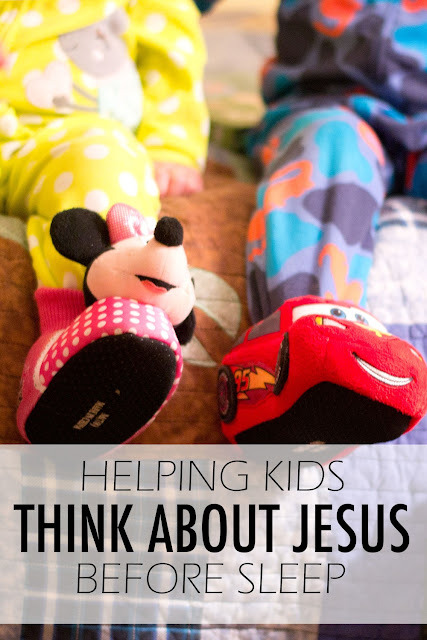 This devotion is full of comforting thoughts for little ones that I think would be appropriate and understandable even for young toddlers (like Gwen). We haven't read through the whole thing, but I have flipped through several of the devotions, and it seems like a lot of them talk about how God loves us and takes care of us. 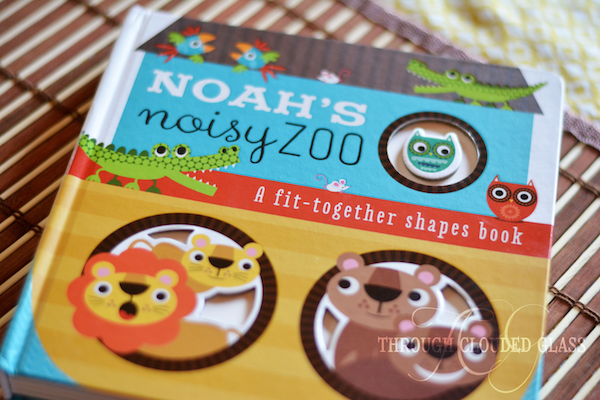 I feel like the topics in this book are perfect to get kids in a peaceful frame of mind for bedtime! 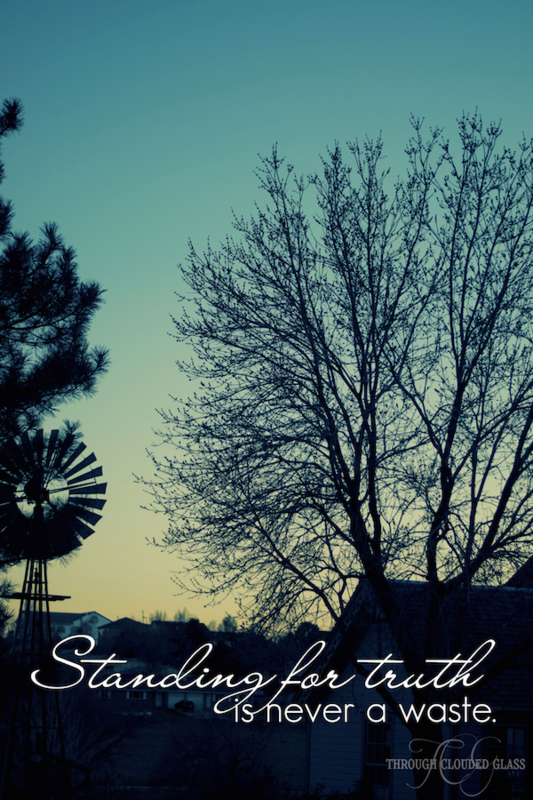 Tommy Nelson is offering to give one of my readers a copy of this great devotional book! If you would like a chance to win, just fill out the form below! Note: I received a copy of this book for free from Tommy Nelson in exchange for an honest review. I have a couple guest posts lined up for this week, one on blessing new moms, and one on beach trip essentials - keep an eye out for those, and I'll be back next week with a recap of all our vacation fun! 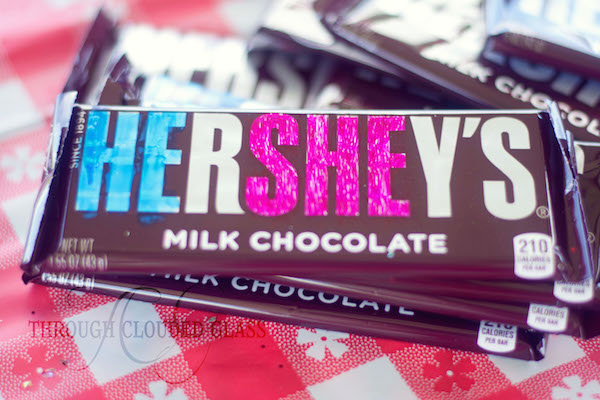 Finally, the post about our gender reveal party last weekend! 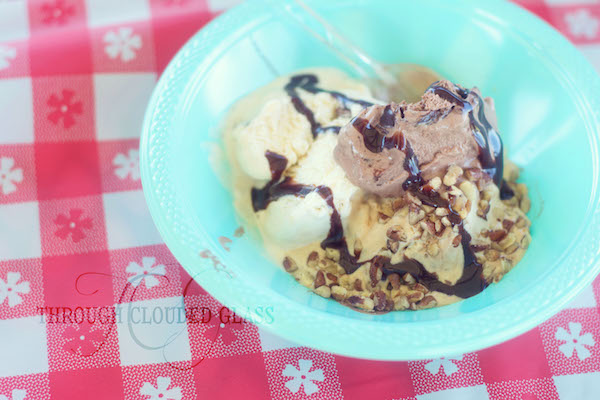 The official theme was "ice cream social", but I am unofficially dubbing this party "the party where nothing went as planned but it all turned out okay anyway". Because really, nothing went as planned. 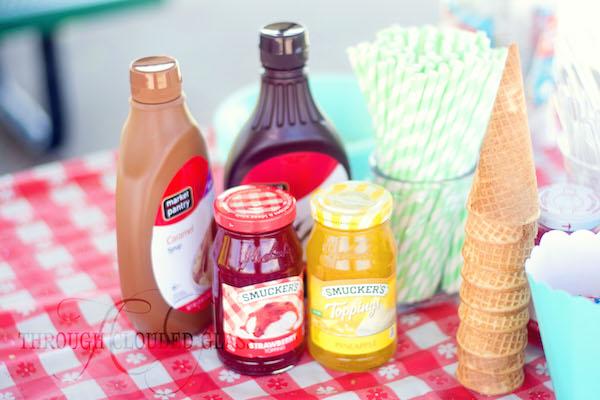 It started with the fact that we decided to try doing this party at a park - I thought, "Self, won't that be so much easier on me, not having to clean the house for a party?" Ha! It was a lot more complicated trying to figure out a park location than I thought. We finally picked one that was first-come-first-serve, with plans to get there several hours early to claim our spot. Then we got there and our park was taken! Enter 15 minutes of internal panic for me as we drove around to find another location. We finally settled on a park shelter that we thought was our only option. It honestly didn't look to impressive from the road, but when we walked over there we realized it was actually a perfect (and quiet!) location! Derek and I got the park set up, and I figured since we started about 3.5 hours early we would be sitting around bored for a couple hours - I was wrong! We took that entire time just to set up and eat lunch. It's a good thing we thought we had to get there so early to claim a shelter! Guests started arriving, and we had them pin on their guesses! Initially when we were planning our party we didn't know how many people would be there, or if everyone would know each other, so we prepared some games. We almost always have a couple games at our parties, because it breaks things up if some of the guests don't know anyone, and it keeps things from lagging - but we honestly didn't end up using any of them, because it was a smaller group and everyone ended up knowing each other! The visiting was going so smoothly that we didn't think we needed to interrupt it with games. But I'll include our ideas anyway, just in case you want to use them. 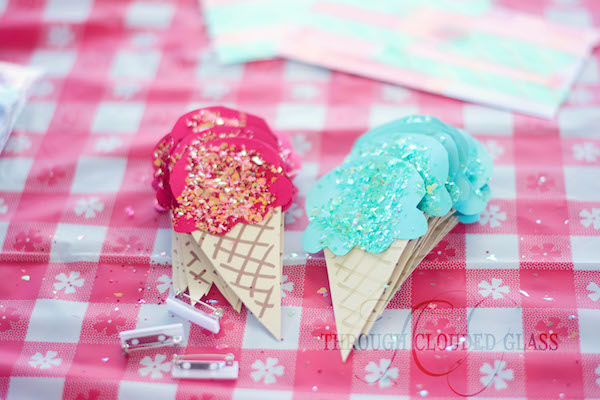 Gender Reveal Party Game Idea 1: Sticking with the ice cream theme, we were going to give everyone slips of paper with an ice cream flavor on it (some common, some obscure). 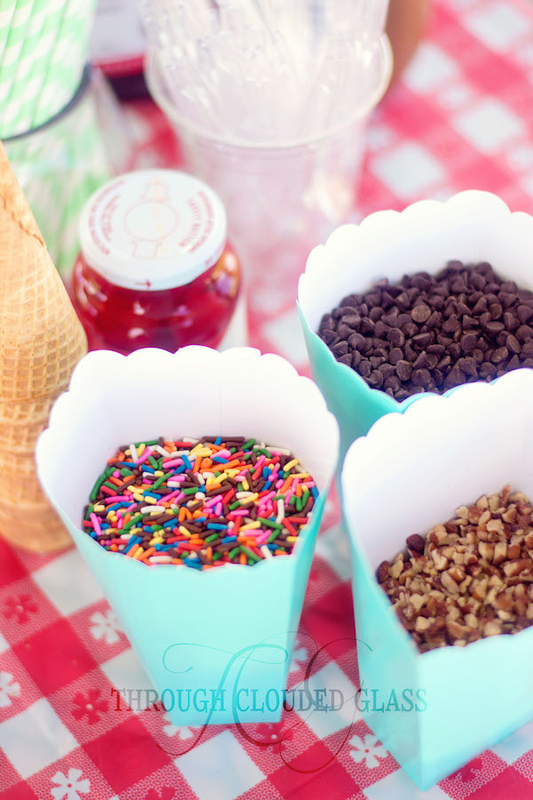 Everyone would be allowed to ask each other yes/no questions to try to figure out each person's ice cream flavor. They could write their guesses down on a piece of paper, so be entered into a drawing for a prize (in our case, $5 Cold Stone gift cards). The park ended up being perfect, because there was hardly anyone there except us. 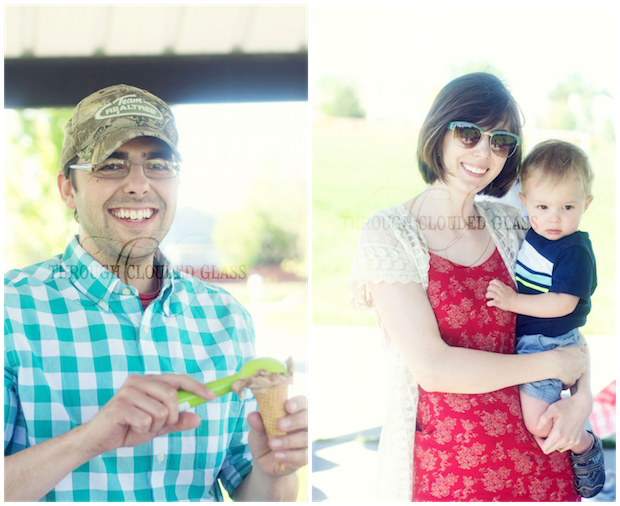 The kids ran around and played on the playground, and the adults visited, and we all ate ice cream. My dad kept saying he thought it was really twins, and he even pointed out one of the ultrasound pictures that kind of looked like it - I kept telling him that they told me there was only one! 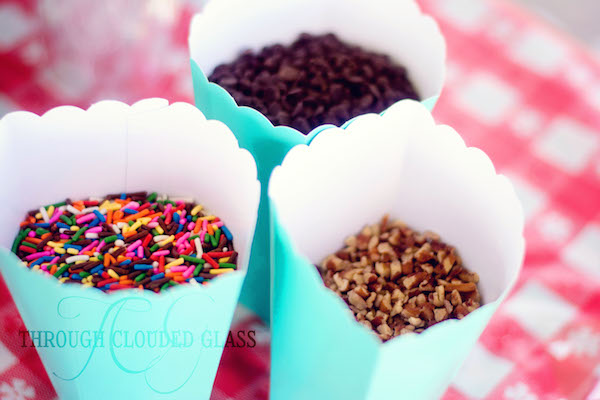 Gender Reveal Game Idea 2: Since this was an ice cream social/picnic type thing, we thought we would do traditional picnic races! We would divide the guests into Team Boy or Team Girl (according to their guess), and have them pick representatives from each team for the races. We were thinking of doing a sack race, a three-legged race, and possibly an egg-and-spoon race. We would keep score, and give prizes to whichever team won the most races. 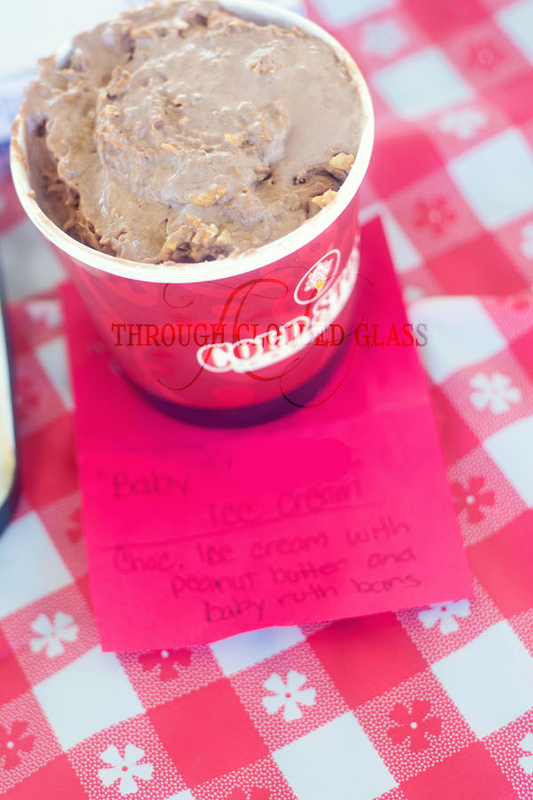 Gender Reveal Game Idea 3: One of our contests did actually work out - on our invitations we told guests they could bring ice cream to share if they wanted, and the most interesting flavor would win a prize ($5 Cold Stone gift cards)! 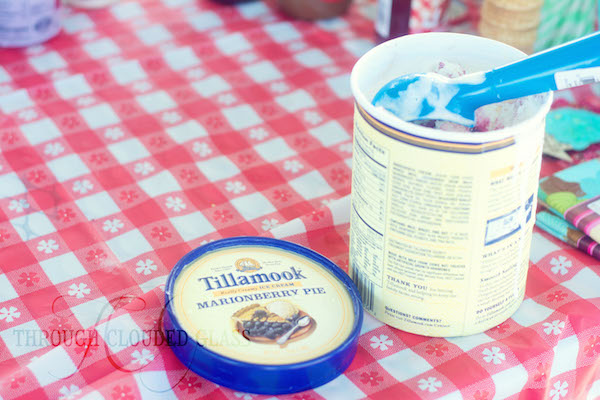 Since we had an extra prize, I picked two winners - my friend Brianne brought a custom ice cream flavor based on my favorites, and my friend Ashley brought Marionberry Pie ice cream! Finally it was time for the reveal (actually we skipped ahead to the reveal, because it was windy and all our balloons were blowing away). We put two safety pins in two envelopes, and had each team pick a member to race across the grass for the envelopes, and then race back to pop the balloons. 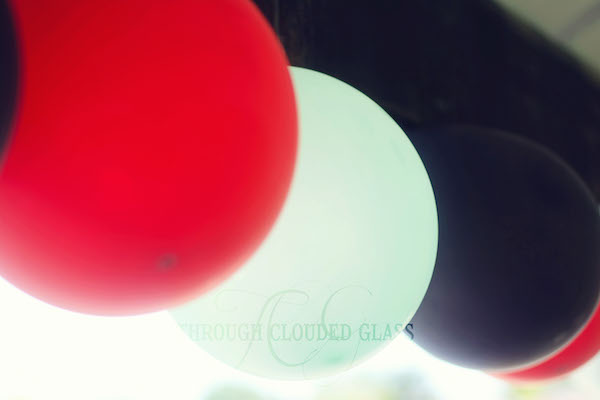 One of the black balloons had colored confetti in it that would give the answer! I don't have any pictures of the confetti because I realized during the race that my friend's child was sitting under THE balloon, and I hurried over there to move him so he wouldn't get confetti in his eyes. Then the confetti balloon popped . . . and all the confetti just kind of fell to the ground. 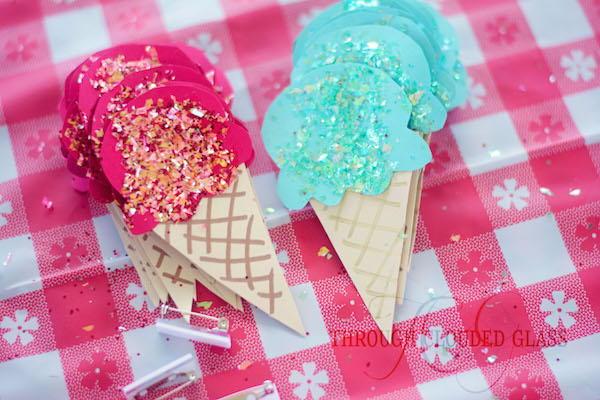 When we tested it out at home the confetti flew everywhere, so that wasn't quite what we thought would happen. So we called out "It's a GIRL!" Yeah, not exactly how we planned it, but it turned out okay! We are so excited to be welcoming a sweet little girl into our family! It'll be so fun to have another baby girl to dress up, and I'm already scheming on how to buy all the headbands I want (because it just seems like she should have some brand-new ones)! 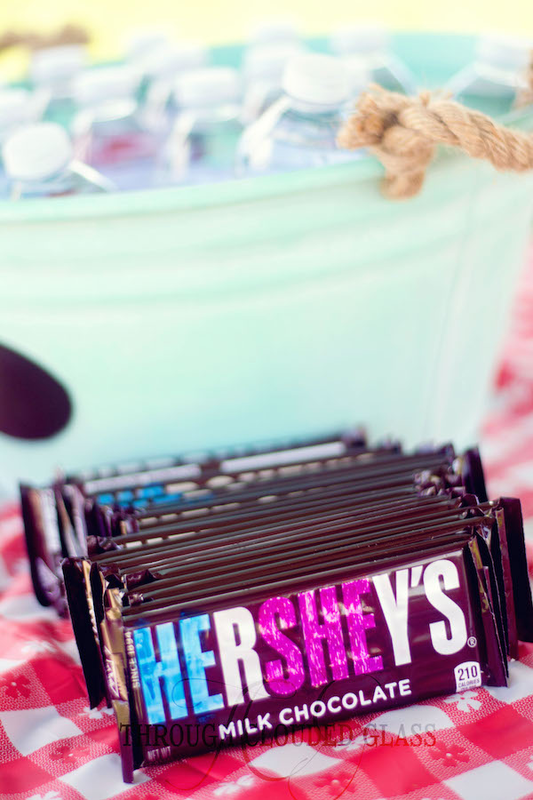 Overall, I am really happy with the way the party turned out - it was fun, and even though I was more stressed during the planning phase of this party, the party itself was one of the most enjoyable for me! It ended up being the perfect group of people, and we had a great time. I have to mention though, that Wyatt was really disappointed that he didn't get to take a turn racing, so we might have to invite some of his little friends over soon and remedy that. We are so excited to be adding another little GIRL to our family! 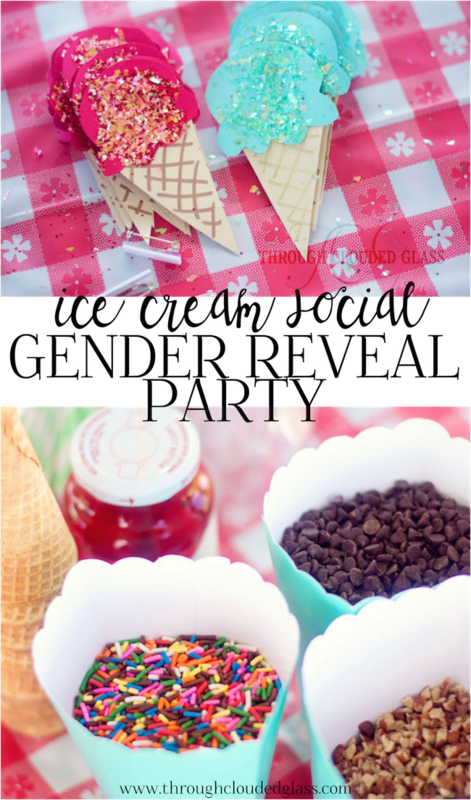 Stay tuned for a post about our ice cream social gender reveal party!